Horse Whispering 101: Connection, Communication, Confidence, and Care! 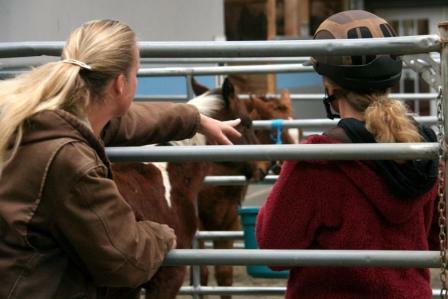 Horse Whispering 101 is the very beginning of our training experience at ROTH geared towards the beginning or returning horse enthusiast, competitor, hobbiest, or professional. To be clear, the Language of Equus isn't a training style or method that you teach to the horses. It is the language they use to communicate naturally. It is their language, and it is far more comprehensive than most ever realize. By working with, and in the language of, Equus, in every aspect of your horsemanship, you give your horse a voice and create a true personalized partnership - a relationship built on trust, connection and communication... not dominance. How to find the right horse for you and personalize your program! Our dedicated, professional and highly qualiifed ROTH Certified Instructors will teach you horse care, horsemanship and the horse's language all at the same time. Discover how to honor your horse, give them a voice, follow your intuition and be the companion they truly need and the leader you are capable of being. No matter if you are entering the world of horses for work, pleasure or competition, Horse Whispering 101 will cover everything you need! Have you been away from the horses for a long while and you want to reconnect with your passion for our equine companions? Are you second guessing the way you have been taught and trained in the basics of interacting with horses and you know there is a better way? 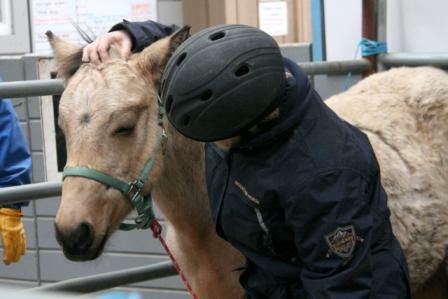 Have you always loved horses but have no experience and don't know where to begin? Are you are a parent wishing to support your child and connect through horses? Are you seeking to gain confidence since an accident, injury or a bad experience with either a horse or instructor? Are you thinking about working with horses in a healing, coaching or therapy capacity but don't know how or need more support to truly support your equine partner? Intuitively do you have an innate knowing that there is more to “horsemanship” that what you see out there today, and are interested in learning the secret and subtle language of the horses? Whether your dream is to find your perfect equine partner for adventures in the saddle or to launch your own business with horses, Horse Whispering 101 will set you on the path of success and give you the foundation you need to create genuine partnerships with the horses. You will learn to connect with a new depth of understanding and communication. This Class is Taught by one of our Amazing Certified ROTH Instructors. Anna Twinney is not the primary teacher of this course. Cost: $1,197 - Early Bird Special Pricing until April 15th, $1,347 after April 15th. Gentling a 5-month old weanling filly at Bitterroot Ranch to be able to move pastures with her friends. Photo by Kimberley Vanderheyden. 2-week old filly negotiates the obstacle course by herself as her mother keeps a close watch in Geilo, Norway. No pressure, no force, no requests, no restraints – just a playground for exploration. 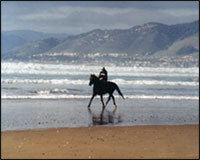 its principles onto horseback for everyday pleasure and problem solving. Learn how to trust your intuitive guidance as you open your heart and your mind to the wisdom of horses. This experience can often be life changing and deals with your personal path to success through methods and techniques which have been developed into simple understandable steps that teach the potential horse owner right through to Olympic dressage and show-jumping champions. Each clinic explores the personal desires and requirements of both horse and handler in order to build a 50/50 partnership which is achieved by "listening" to one another. Confidence is creating harmony through an open mind in order to gain knowledge and understanding of the way the horse perceives the world. methods and concepts to successfully solve behavioral problems. Learn methods based on trust and designed to have your horse want to work with you rather than feel forced too. 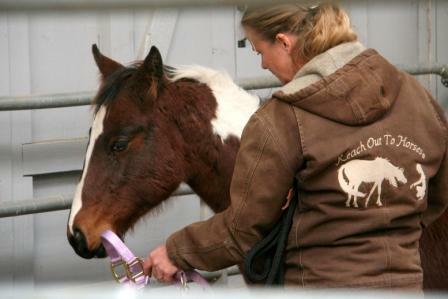 the Reach Out to Horses® clinic. 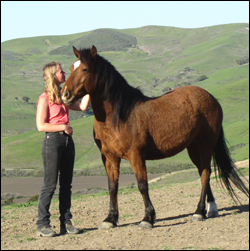 Through demonstrations, lectures, and hands-on exercises, Anna will introduce you to the very same techniques that she has used, all around the world, to build genuine trust-based partnerships with thousands of horses. How are these methodologies different? Why do we call them the next generation of horsemanship? Simple. The ROTH Methodology is not a training program. The foundations of ROTH, as designed by Equine Behaviorist, Anna Twinney, are communication; the true language of all horses. The program you will discover comes from the horses. Anna won't show you a training method that you can teach to your horse. She will reveal the communication that your horse can teach to you, and how you can use that language to not only train your horse for any discipline, but also to create a relationship with your horse. By giving your horse a real voice, understanding them and being with them as individuals, you will uncover, not a horse, but an individual and a partner. If you think that the horse's language is merely body langauge and physical cues, then be prepared to have your life changed and your mind blown. The language that horses speak amongst themselves, every day, is subtle and comprehensive. They are having a conversation all the time that you are most likely not even aware of. And like any language, the horses won't speak to you, they can't speak to you, if you don't understand what they are saying. 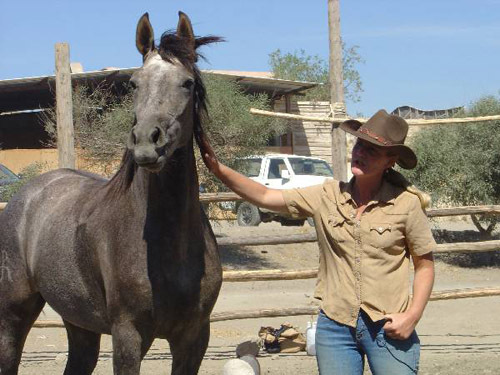 Anna has spent her entire career as horsewoman, almost 2 decades, learning, studying, understanding and perfecting the language and the methodologies that you too can use with your own horses. 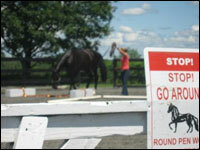 Part I - “De-Mystify the Round Pen": Round pen work isn't "chasing a horse around a pen"! 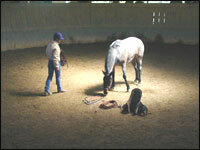 When used correctly, the round pen can be extremely effective in communicating, training and learning about your horse. You will experience a language that goes beyond body gestures, and create a lexicon that can be used in and out of the Round Pen. Part II - "Muscle Testing": Explore this easy to learn and use tool to identify what your horse needs to be happy, healthy, and whole. Get direct feedback from your body - the body does not lie! Part III - "Animal Communication": Are you ready to take your communication beyond body langauge and training cues? Then it is time to discover the world of Interspecies Communication and explore a whole new relationship with your horse. Check the list below for a Holistic Horse Day near you! April 7, 2018 - Red Bell Run Sanctuary, Columbus, NC, U.S.A.
May 5, 2018 - Manor Farm House - Peaceful Stays Colston Bassett, Nottinghamshire, U.K.
June 15, 2018 - Mounting Miracles Ranch, Lafayette, CO, U.S.A.
July 7, 2018 - 13 Hands Equine Rescue, Bedford Hills, NY, U.S.A. Please Visit the Events Calendar to get more information and register for the Holistic Horse Day event in your area. Click here to go to the events calendar. 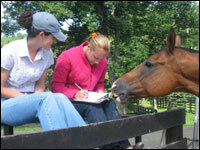 Racing staff arranged to have a private “Starting the young horse” clinic with Crawford Hall and Anna Twinney during the Fall of 2002 to learn natural horsemanship methods and techniques to enhance their racing program. By witnessing proven results their minds were open to learn new methods, which are highly effective, safe and very efficient for training great numbers of horses or just one. This offer is now available to any organization that would like to discuss their specific needs with the Reach Out team. Learn techniques which allow you to start a horse under saddle safely in 30 minutes! The same concepts and methodology can be used for mature horses to re-establish a more cooperative relationship between horse and rider. This is a hands-on clinic and you will be learning the technique in all aspects of the process. You will begin to learn your body language and its affect on the horse as its energy relaxes into the partnership that is being formed. Whether you have a dressage, show-jumping, polo, long distance riding, racing or western background – this clinic will help you understand your horse’s needs in order to achieve a successful partnership. Why not create a staff training weekend or a club outing, incorporating new ideas and handling horses in a non-violent manner. Take a weekend out of your busy schedule and allow everyone to come together and learn new methods. Rather than leaving it to the last minute and putting the ramp up quickly to ensure your horse stays on the trailer, create an environment to encourage your horse to want to load! This is your chance to work alongside Anna with your horse. During a weekend clinic you will learn all about: Preparing yourself mentally, creating the correct and safe environment and the safe use of equipment. You will know how to teach your horse to come off pressure and why it is important to keep your adrenaline and that of your horse down. We will touch upon alternative methods to relax your horse, while discussing why food does not work as a reward. Strategies and helpful hints leading up to loading will be explored as the weekend progresses. Expect the unexpected. Watch the soft, open hand to prevent Ransom from further harm. Ransom praised for standing close to the new trailer, no further questions. Ransom decides its time to leave the scene….without prior warning he rears & spins. Moments later he is able to eat nearby foliage in the vicinity of the trailer Relaxation and an ability to digest information was suggested, he was able to oblige. We finished on that note. 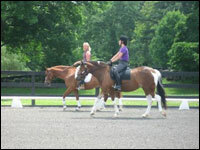 Ground driving is a useful tool for all horse owners to master. It can be helpful when preparing young horses for their first time rider, by teaching them speed and direction and incorporating leg aids. Witness how your horse learns to accept the lines and educate himself – as he becomes light and responsive to the walk, trot canter or lope. Watch how the inner balance develops without him leaning or pulling on an outside source. It is also a wonderful tool to exercise your horse and teach him rhythm and balance while developing muscles for maximum collection. You will learn how to incorporate your body language to gain impulsion and communicate necessary signals. You will also explore how your body can be effective when free-schooling your horses while creating a 2-way communication system. There will be exercises to help you develop your timing skills and we will discuss problem solving issues that could be encountered. Gain personal insight into this unique and impeccable method through private instruction from former MRILC Head Instructor Anna Twinney. Learn how to communicate with your horse from an instructor, who has coached over 5,000 international students. Her coaching session is tailored to meet your needs and includes personal advice on horse psychology, natural behavior and how to develop and improve your relationship with your horse based on mutual trust, respect and communication. 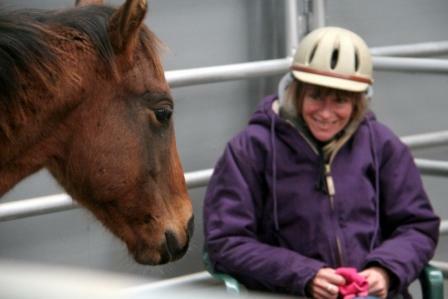 An affordable way to gain coaching in gentle horsemanship. Anna has clients from all around the world who call for one-hour sessions to assist them to understand their horses’ needs and solve potential issues. Sarah Vanecek continues to educate Emmerson (2 yrs old) as he grows into himself, by creative body & mind stimulation. Purchase a consultation. 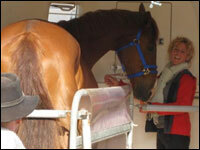 Please e-mail info@reachouttohorses.com to arrange the next available appointment. To purchase a consultation online click on the icon below. Cost: $125.00 per one-hour session. If you have not made arrangements with Anna already, be sure to note the preferred dates and times for your consultation(s). Anna will then contact you to confirm. Please view Anna’s schedule to determine her current whereabouts! Please be sure the phone number and email address on your order are correct! Full fee is charged for sessions cancelled without 48 hour notice. SOLD OUT! AUDITING STILL AVAILABLE. Prerequisites: This is not a beginner class and previous horse experience (preferably with Anna) is strongly advised. Contact Reach Out to Horses for more information - info@reachouttohorses.com. Cost: $1,597 Early Bird Special Until July 1st, $1,697 after July 1st. Audit the entire week in Wyoming for only $300! Audit the entire week in California for only $300! Contact Vin at info@reachouttohorses.com for more information about auditing this event. Watch all our videos of previous years' life-changing experience! You will have the chance to understand, first-hand, the power of compassionate leadership and positive reinforcement, while creating the clarity in boundaries and balance. And, of course, maybe the best part is that you get to spend hours of unforgettable, precious time with these young horses! 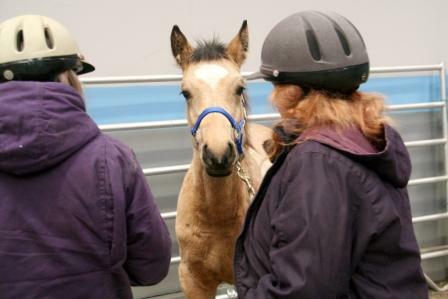 We want our foals to feel safe, and their experiences with humans to be positive, memorable ones. These first important lessons stay with them for the rest of their lives, and so the training must be done right. Acknowledging the "whisper" is crucial; recognizing the "try" is an art. 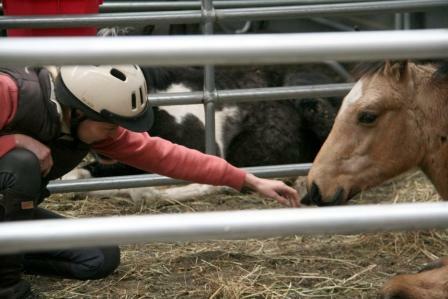 Spend 7 fun-filled, info-packed days learning the art of compassionate, effective gentling, and work with a group of rescued foals. Help start these young lives on the path towards a gentle, trust-based partnership with humans, and enjoy a life-changing experience you will never forget! Your foal has a memory for life. Make their first memories good ones. Space is limited and participation is on a first come first serve basis so sign up today! Prerequisites: Contact Reach Out to Horses for more information at info@reachouttohorses.com. $1,597 Early Bird Special until July 1st, $1,697 after July 1st. Join us as an Auditor for only $300 for the entire week! For more information contact Anna at info@reachouttohorses.com. For accommodations the town of Sisters is actually closer to the faclity than Bend, Oregon. these methods with foals but they are a great foundation for untouched horses as well. Learn more about this info-packed DVD Set! Anna offers a guest lecture service to organizations, colleges and universities looking for new areas of study. 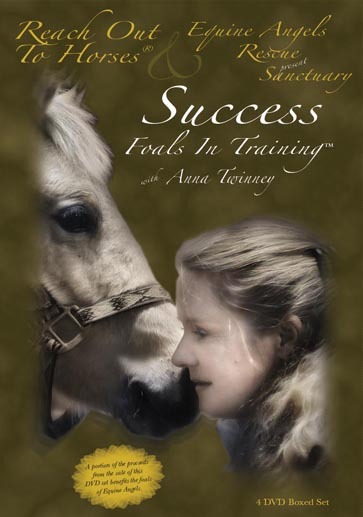 She can share her experiences on all aspects of horse psychology and training, from gentling to starting a young horse under saddle through to training horses for competition. 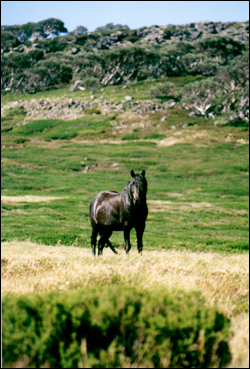 Horse behavioral lectures including herd dynamics, in particular, make a stimulating addition to a syllabus in which students can learn more about methods of natural horsemanship. Comparing learning styles of horses and how this parallels humans, together with exploring horses as our mirrors becomes eye opening. 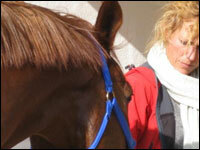 Anna will demonstrate how to create a long lasting trust based partnership between human and horse. She will begin to help you understand how to read your horse and what a 50/50 partnership entails. You will be given insight into starting the young horse in a timely fashion, while learning to listen to his needs. During problem solving demonstrations we will peel away the layers that are causing concerns for both your horse and you to discover the underlying issues, while reinstating confidence and understanding for both parties. With a simple, effective and understandable approach you will gain knowledge that can be taken from the round pen to your home environment.